Over time, the hole of an ear piercing can become stretched out, elongated, or completely torn. 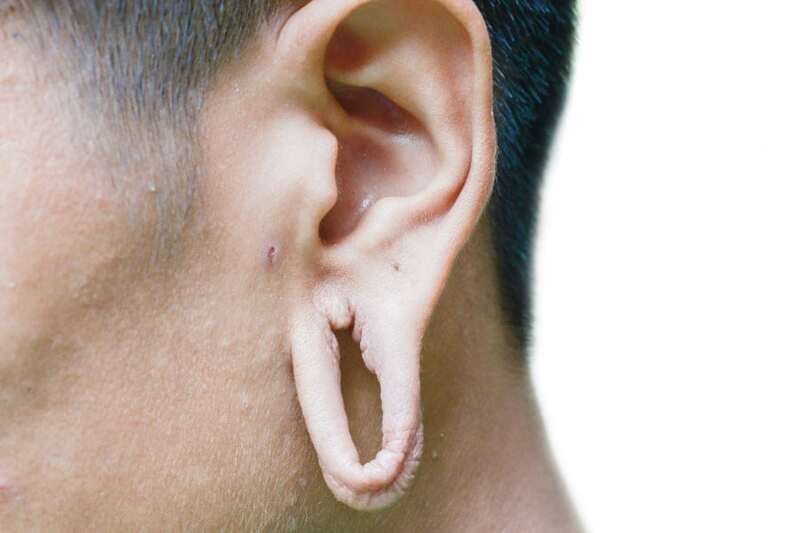 This can be a result of trauma, wearing heavy earrings, or purposely stretching your earlobes with gauges. A quick and easy outpatient procedure will return your earlobes to their desired appearance. At Aesthetic & Dermatology Center, earlobe repair surgeries are one of the most commonly performed cosmetic surgical procedures. This is considered a cosmetic procedure and NOT covered by insurance. During the short procedure, your ear will be numbed with a local anesthetic, rendering the procedure relatively painless. After removing the damaged portion of your earlobe, your dermatologist will join the skin on your ear together with many small sutures. Most individuals may resume normal activities immediately after the procedure. Slight bruising or swelling may occur that may be treated, usually with over-the-counter medications, as needed. If you want the appearance of your ripped or torn earlobe repaired, contact the greater Washington DC area’s leading dermatologist to restore the contour of your earlobe. To determine whether earlobe repair is right for you, call our office today at (301) 610-0663 or request an appointment online. Earlobe repair is a cosmetic treatments and is not covered by insurance.